Virginia Road Elementary School scholars are the best!!! Our students know that attending school every day will assist with putting them on the right path to greatness! One of the duties of an attendance counselor is to implement to opportunities and events to highlight our scholars and their tenacity to attend school every day and on time! The goal of LAUSD is to have students at an attendance rate of 96% and higher. So what does this mean?!! Students can miss a total of 7 absences for the entire 2016-2017 school year. 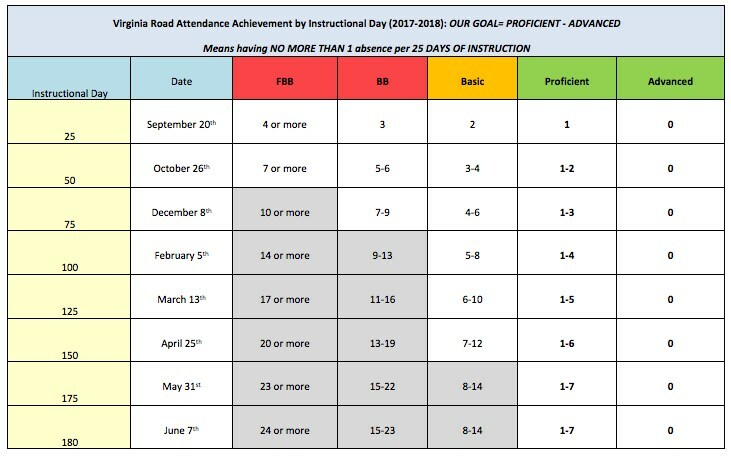 So far this school year I see students who had excessive absences and tardies starting the school year with Advanced attendance (100%)!! They are being responsible and showing they are capable of being the best!! We here at Virginia Road know that attendance is a vital factor for our students to thrive academically. Wednesday, September 21, 2016 marks the 25th day of instruction for the 2016-2017 school year! Students who have 0 to 1 absences as of this date will be recognized as having Advanced to Proficient Attendance! As the Pupil Services and Attendance Counselor, I want our students to know that they are extraordinary and can strive for excellence! It takes a village to raise our children so our families, educators, paraprofessionals, support staff, and other stake holders must work as a united force to make sure that our future doctors, teachers, nurses, lawyers, and entrepreneurs do just that!